Founders and co-founders talk about their ventures, the early days, learnings, tribulations, and life at startups. The questions are well thought of, and serve to drive the conversation along relevant lines, and are not really the cookie cutter types that you see most of the times. Nor are they intrusive or attempt to foist the interviewer's opinions on the interviewee. There is no theme to the ordering of the interviews that I could make out, which the book would certainly have benefited from. Some obvious founders are missing - like Bill Gates, Larry Ellison, Larry Page, and others - but enough reams have about these founders and their companies anyway. Instead of getting smart management gurus to dissect successful companies and not so successful companies and come up with grand theories and equations into which the ingredients of companies and the external environment in which they operate can be fed to produce a result that predicts how, why, and when a company would succeed, why not let the founders of successful startups talk about their experiences? Do this with a sufficiently large number of startups and let the reader figure out for himself if there is indeed any secret sauce to making a monetizable pizza. And many a times it isn't even about money, initially. There are 32 interviews here. I could not make out any thematic ordering of the chapters, but there may well be that has escaped my puny brain. There is no alphabetical ordering here, either by the founders' names or the companies', nor a chronological one. I don't think people will want to read this book from start to finish in one sitting. Nor would, or should, people read it from the first page to the last in that order. Since each chapter works quite well on its own, I suspect, and this is pretty much how I am reading this book too, people will pick this book up and read a chapter or two, pick it up later and read a few more chapters. There are the obvious interviews like the ones with Sabeer Bhatia (Hotmail), Steve Wozniak (Apple), Tim Brady (Yahoo! ), Craig Newmark (Craigslist), but also some lesser known names from more well known companies or well known products like Max Levchin (PayPal), Paul Buchheit (Gmail), Caterina Fake (Flickr), and many others. 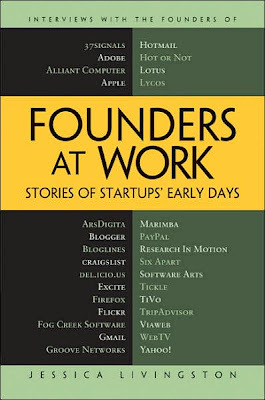 If you are thinking you can read this book, cover to cover, and again, and somehow magically come up with the recipe for building a successful startup, then I don't think this book is for you. There are no magic mantras here, no astras, no silver bullets, no formulae, nothing. The recipes for success differ from company to company. Hard work, perseverance, teamwork, some amount of intelligence seem to be the common ingredients. Luck is important, no mistaking. Being in the right place at the right time also helps, but it is not sufficient, nor is it a necessary condition in my opinion, reasonably speaking. There is Evan Williams, co-founder of Pyra Labs (Blogger), who says "I came to California after playing with the Internet for a few years because Nebraska wasn’t the place to be, very clearly." I obviously do not mean that having the idea for nuclear fission in the tenth century would mean you could be successful in building an atomic bomb then, which is why I said 'reasonably speaking'. Having good people helps. Good VCs helps. Suits - Foreward by Paul Graham. Early stage startups are the exact opposite of this. And yet they’re probably the most productive part of the whole economy. Why the disconnect? I think there’s a general principle at work here: the less energy people expend on performance, the more they expend on appearances to compensate. I think this has a lot to do with perceptions. We see successful people wearing suits, successful from the conventional metrics that we employ to judge people, successful people like Maddoff, Ernie Webbers, Jeff Skilling, Ramalinga Raju, Ketan Parikh, Kenneth Lay, who were successful, till one day when they weren't. We see such 'losers' as Mahatma Gandhi, Vinoba Bhave, Aurobindo Ghosh, Swami Vivekananda, and others who were not so nattily dressed (one of these people was actually derided as a 'half-naked fakir', by one of those in a suit). Since hard work is so much tougher than simply adorning a suit, we are quite tempted to try and adopt the sartorial route to success than the intellectual. It also has to do with intimidation - "my suit is more expensive than your dhoti, so I am better than you'. It also has to do with the way our minds work - we see successful people in suits so often that we generalize that anyone in a suit must be successful, or at the very least eager to be successful. Well begun is half done. That half part is especially easy if it involves putting on the right clothes. Livingston: What advice would you give to a young programmer who’s thinking of starting a startup? Levchin: Try to have a good cofounder. I think it’s all about people, and, if you are doing it completely alone, it’s really hard. It’s not impossible, in particular if you are a loner and introverted type, but it’s still really hard. Livingston: Did things change a lot after PayPal was acquired? Levchin: I think the acquirers tend to be more—it pays to be different from the founders; otherwise, you still have this clinging-on of the original culture. It’s very sad that, when you buy a company, you have to sort of squash a lot of the original stuff, but if you don’t, you foster this festering of distrust and dislike. Everyone was getting funded, but it is still completely just a network. You have to know the right people. Whether it’s good times or bad, you have to know people and you have to talk their language, and we were just from a different place and not hooked into that at all. The problem was, we didn’t see a business in Blogger. This was during the boom, but we weren’t one of these companies that was just, “Let’s get eyeballs.” We talked a lot about the stupidity of a lot of the dot-coms and raising too much money. We were very product driven. Even when I was in school, I’d try to make up alternative solutions to math problems. When I was at Google, they had this huge focus on academia. Grades were super-important. Getting good grades at a good school is one filter of brains, but it might also suggest you like following rules. This statement below is so so true, cannot stress this enough. One thing that I used to be bad at was paying attention to how other people are feeling. So when problems came up with some of my coworkers, it totally surprised me. That stuff shouldn’t surprise you, and it did. There was a period in the late ’90s when starting companies was just a slamdunk, no-brainer kind of thing. The people that were going public with $100 million valuations were punk kids [who] just graduated from college and knew nothing about anything. There were some really bad implementations of very pedestrian ideas, and we thought we could do a lot better. ... So the idea was that the consulting would grow linearly with the number of people as you hired more good people that you could rent out as consultants, and the software business would grow like the hockey curve because, at some point when it took off, you wouldn’t actually have to hire new people. You could just make more copies of the software you were selling. That was the theory. Realistically, it didn’t work, but we were able to suspend disbelief for long enough to start the company. Knowledge is power. Joel argues that knowledge of what your competitors are doing is not power. Debatable, and certainly so if taken as dogma. I remember thinking that, no matter what we knew that the competitors were doing, the information was completely useless to us. It never really changed what we were doing. If it’s like, “The competitors are going to do feature x,” well, if that’s such a good feature to do, why aren’t we hearing about it from our customers? A lot of ink and internet bandwidth has been spent on debating whether the cogs in the wheel, the nobodys, the programmers, should have offices, or should they be herded into cubicles, the likes of which Dilbert is forever condemned to vegetating in. What was astonishing at the time was that none of these companies were making any effort whatsoever to make the work environment pleasant and to treat the people that they were hiring with enough respect that they would be able to attract people. Things that to us are basic: Aeron chairs; private offices with doors that close for every programmer; letting programmers report to other programmers, so that your boss will understand you. We had 4 weeks of vacation and another week of holidays, which you can move I think. Microsoft has provided offices, with doors that shut, to its developers for the longest time I can remember. I recall visiting a friend's office, who worked at Microsoft, where he had this small office, independent office, with a door that shut, so he had privacy and quiet in which to work. Yes he could have surfed the NFL site, but people will do that even when seated in cubicles. Because everyone else is doing the same. Because that's what people feel they have to do to get back at the faceless, heartless borg of a company they work for. Which is sad. If you have had any interest in photography, and have surfed the web in search for information, you would know of the popular photography site, www.photo.net, run by Phil Greenspun. He also wrote a series of articles, a story plus photo log, had strong opinions on certain things. His company, ArsDigita, is mentioned a lot in the book, by Joel Spolsky, so either way this chapter should be interesting. Just as management literature talks about the core competence of corporations, and what your strategic advantage is, Greenspun talks about how companies are good at hiring and keeping one type of employees that are good, really good. People used to say, “Why should we pay you guys $30,000 to $50,000 a month to do this thing, when we can just hire our own programmer?” What I would tell them is, “Each company has one class of stars. In some companies maybe it’s the salespeople, and in some companies maybe it’s the mechanical engineers. There’s going to be one class of people for whom it’s really easy to hire more people like that.” Hospitals are a good example. If it’s a good hospital, the doctors will be good, and it’s very easy for them to hire good doctors. But it’s hard for them to hire any other kind of person. I have maintained that if you cannot explain something then you don't know it. It doesn't have to be in English, if English is not your first language. Use Hindi, Tamil, Kannada, Punjabi, Bangala, Marathi, Gujarati, Telugu, Hyderabadi Hindi, 'Bambaiyaa' Hindi, Sanskrit, or a mix of whatever languages you know. But you have to be able to explain it. If you can't then you don't. People don’t like to write. It’s hard. The people who were really good software engineers were usually great writers; they had tremendous ability to organize their thoughts and communicate. The people who were sort of average-quality programmers and had trouble thinking about the larger picture were the ones who couldn’t write. Livingston: Didn’t you also insult them by describing publicly what it was like to have VCs run your company? Greenspun: Only after they sued me. I said it was like watching a kindergarten class get into a Boeing 747 and flip all the switches and try to figure out why it won’t take off. That was before I got my pilot’s license. Now I know how apt it was. Steve Perlman, Cofounder, WebTV Using WebTV you could surf the internet using your television. This was sold to Microsoft for some US$500 million. What Microsoft did with it is now known. Except that they couldn't make a success out of it. Maybe it was an idea ahead of its time. Streaming internet, or what Netflix is doing, by streaming DVDs to your television via the internet is really what the concept of WebTV was about, albeit in a different manner, and in a different context, and with the technical limitations that existed then. There is a huge amount of research that suggests that not getting enough sleep can affect your performance. What I would typically do is not sleep for 2 nights; then I would get 4 hours of sleep and go back to work for another 2 days in a row, and then get 4 hours, and so on. It was the hardest I’ve ever worked in my life. Sometimes I’d take 10-minute cat naps by just laying my head down on my shoulders—just so I’d get some REMs. As soon as the dreams come, it resets your brain a little bit and you’re able to work again. Yes - it is quite possible to work on something for hours on end, till you lose sight of what time of the day or night it is, and I certainly can attest to that. However, what is plain indisputable is how long you can do that without completely freezing up. I maintain that while in the short term it can be incredibly productive, when your train of thought is running at a breakneck speed, and your body, overdosed with caffeine and sugar, is able to keep up with the mind, and you can get done in hours what would otherwise take days, or in the hands of the incompetent, forever and then some more, you cannot keep that up for any reasonable length of time. You HAVE to take a break, to recharge. Different people have different thresholds. It depends on the task. It depends on the motivation. It depends on who you are working with. And many other things. But at the end of the day, what it comes down to is denial - you know your productivity is slacking off, you are getting sloppy, making mistakes you otherwise wouldn't, yet are unwilling to acknowledge it. Or if you do, you dismiss it by saying something like 'this is just a blip, I need a stronger cup of coffee' or something to that effect.